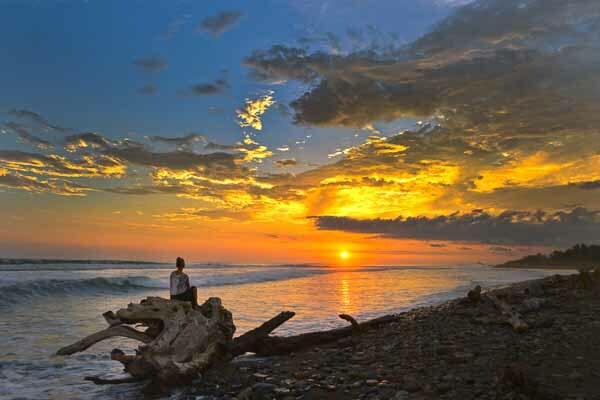 The quaint beach town of Dominical lies on the northern border of the Osa Peninsula, considered the most bio-diverse place on Earth by the National Geographic Society and the United Nations. Dominical and the surrounding areas boast world class surf, lush jungle covered mountains that soar from the sea, an abundance of exciting adventure opportunities and spectacular natural attractions ranging from waterfalls to sea caves to hidden beaches and more! Dominical offers a number of great restaurants, from local “tipico” cuisine to international options such as sushi, mexican, vegetarian, cafes, steak houses and more. Most everything you need can be easily gotten in Dominical, with amenities such as a health food store with over 100 organic fruits and vegetables as well as natural products, an artisan market, a bank, a variety of stores and shopping and several grocery stores. 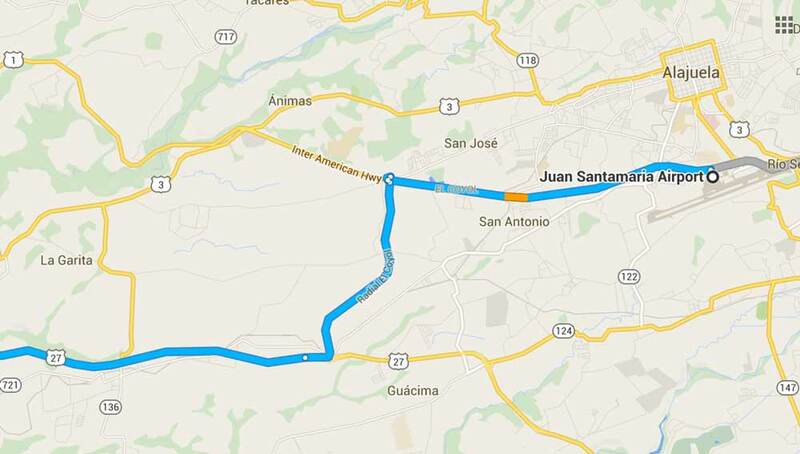 To get from the airport to Dominical, take the Inter American Highway 1 to the Radial El Coyol. Take the third exit on the roundabout and continue straight until you reach Highway 27. Head west on Highway 27 until you reach Highway 34. Head south on Highway 34 until you reach Dominical. Danyasa is located on the main road through Dominical. Note that Highway 27 is a toll road so you will need to have around $10 cash with you. The toll booths accept USD. Getting to Danyasa Eco-Retreat is easy. If renting a car, you can follow the directions and maps on this page to find us. 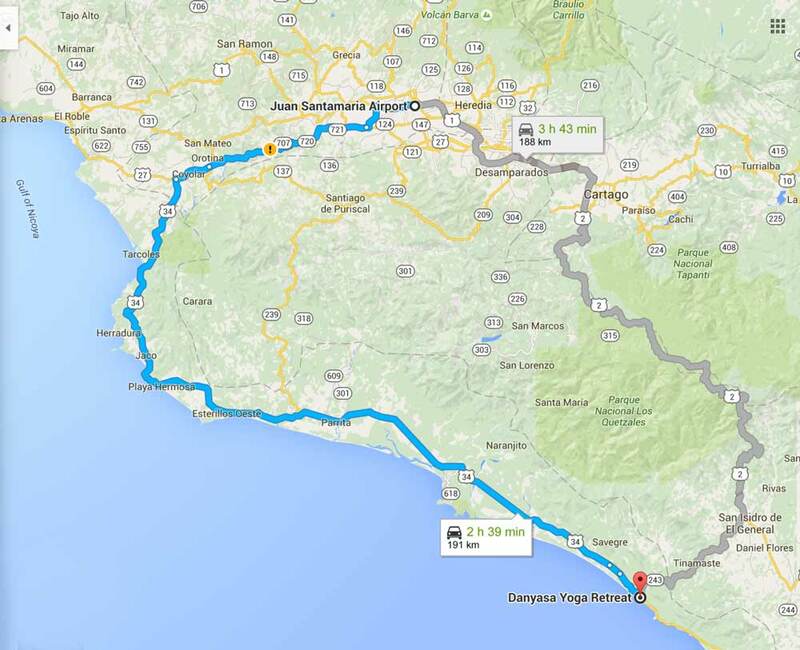 Allow 3 hours to arrive in Dominical from the airport in San Jose. We do highly recommend renting a GPS with your vehicle or, if you have an unlocked smart phone you can get an inexpensive phone card with a data plan at the airport and use Waze or Google Maps to navigate. Note that it is easy to get lost driving as most streets in Costa Rica do not have signs or even names! Private shuttles from San Jose airport or the city run $160 and take about 3 hours. No waiting and they can be arranged at any hour. We are happy to help you arrange a private shuttle if you need one. One can also take a 20 minute airplane flight from SJO to Quepos and then take a taxi or rent a car to drive the remaining 30 minutes south to Dominical. And lastly, public buses can take you from downtown San Jose right to our doorstep. The buses leave from the Tracopa bus terminal. You will have to buy a ticket to Uvita, but you can get off anywhere. Make sure you get off in Dominical and don’t go all the way to Uvita. Bus times vary. You an check the Tracopa Bus website for the latest info. The bus takes around 5 hours to get to Dominical. We are located on the main street in Dominical, across from the public school. Look for the Danyasa Eco-Retreat sign on the right-hand side heading towards the beach. If the boutique/reception is closed, there is an intercom on the sign post.